AH-Harr! 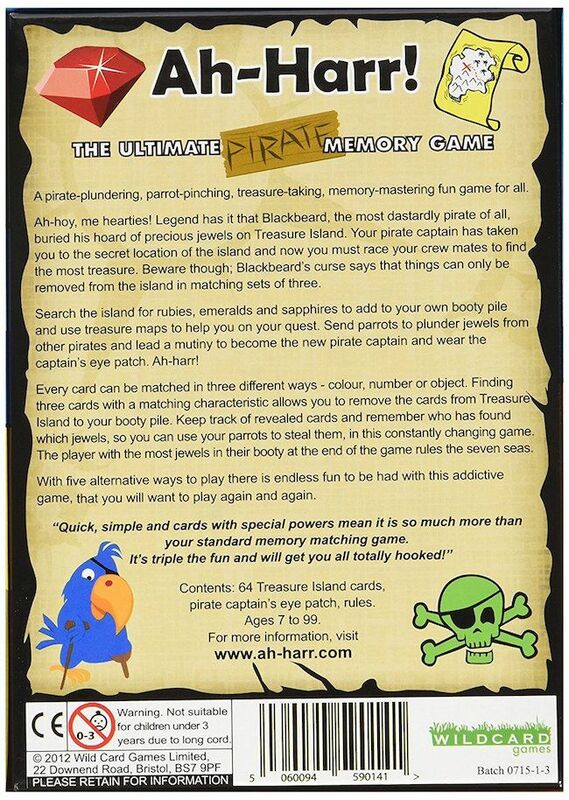 is the ultimate Pirate Memory Game. 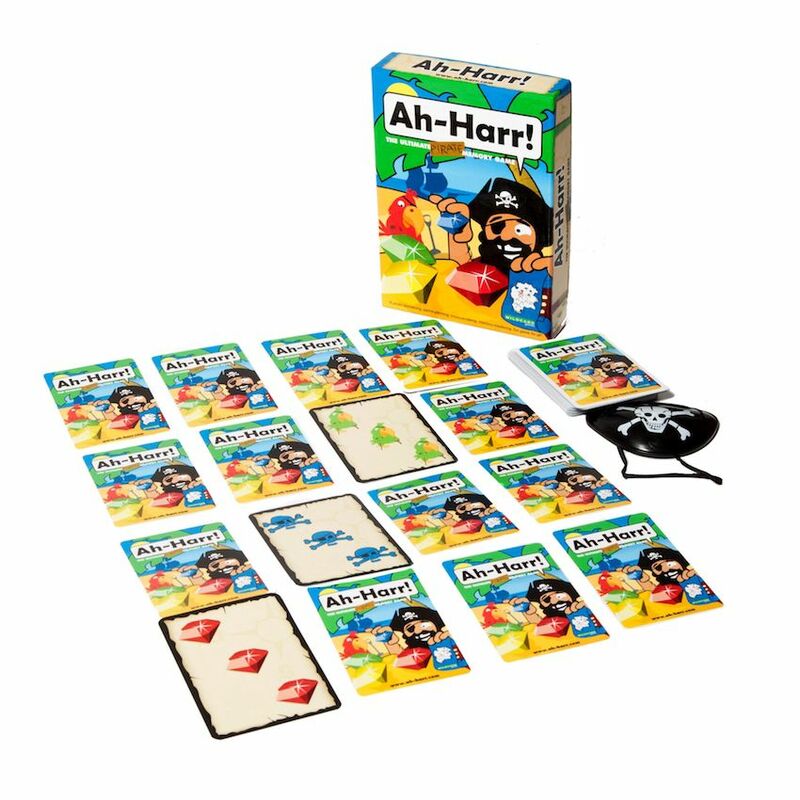 To play this matching card game, each box contains 64 Treasure Island cards, a pirate captain's eye patch and the rules. Legend says that Blackbeard, the most dastardly pirate of all, buried his hoard of precious jewels on Treasure Island. Your pirate captain has taken you to the secret location of the island and now you must race your crew mates to find the most treasure. Beware though: Blackbeard's curse says that things can only be removed from the island in matching sets of three. Search the island for rubies, emeralds and sapphires to add to your own booty pile and use treasure maps to help you on your quest. 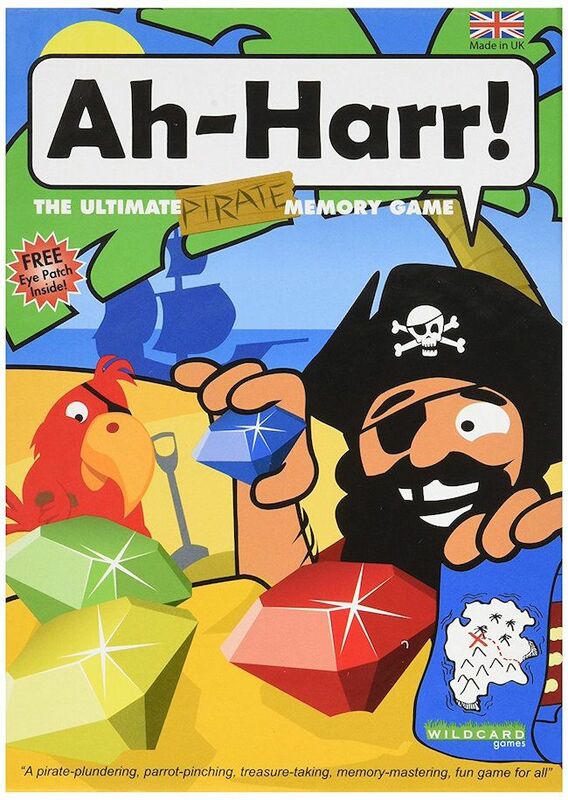 Send parrots to plunder jewels from other pirates and lead a mutiny to become the new pirate captain and wear the captain's eye patch. 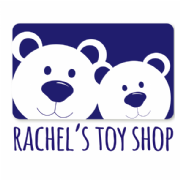 Every card can be matched in three different ways - colour, number or object. Finding three cards with a common matching characteristic allows you to remove the cards from Treasure Island to your booty pile. Keep track of revealed cards and remember who has found which jewels, so that you can use your parrots to steal them in this constantly changing game. The player with the most jewels in their booty at the end of the game rules the seven seas. Ah-Harr! Recommended for 7 years and up, not suitable for children under 3.